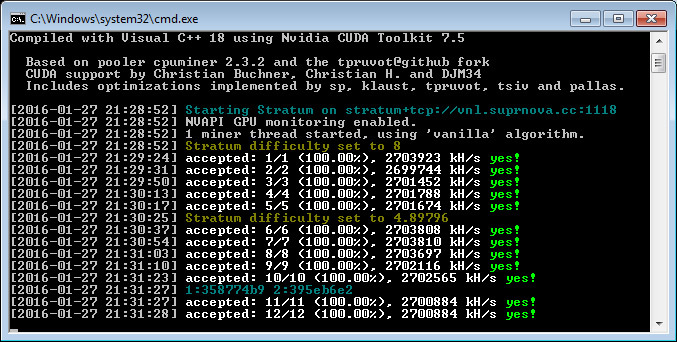 We have compiled ccMiner 1.7.4 tpruvot’s fork Windows binary in a version with the optimal settings for mining Vanillacoin (VNL) on more recent Nvidia-based GPUs as suggested by Alexis Provos and with his performance optimizations as implemented by tpruvot in the latest code. This Windows binary is a 32-bit one compiled with CUDa 6.5 and only with Compute 3.5 support as apparently this provides the optimal performance at least on Maxwell-based Nvidia GPUs (Faster than using Compute 5.2 on them). Below you can also see a comparison that we did with Nvidia GeForce GTX 970 from Gigabyte (WF3OC) and a reference design Gigabyte GTX 980 Ti to see the difference in performance with the regular version when using CUDA 7.5 and Compute 5.2 and with the optimized CUDA 6.5 and Compute 3.5 version available for download below. Do note that although this binary will work with other algorithms as well as the Blake 256 8-rounds used by VanillaCoin it may not provide the optimal performance for other algorithms as it is targeted to provide the best VNL mining hashrate. Do note that increasing the intensity over the default setting (no manual -i intensity option used) even on a regular release will provide some increase in performance as you can see in our comparison going up to the maximum supported intensity of 31. Have in mind that increasing intensity also makes the system a bit less responsive the higher you go and at 30/31 it will be lagging more, but the extra performance gain you will get with the optimal binary and higher Intensity setting is significant, so for a dedicated mining rig for VanillaCoin you should definitely go for it. Update: This particular performance optimization is for VanillaCoin’s Blake256 8-rounds implementation, the CUDA 6.5 and Compute 3.5 compilation of the particular CUDA code for that algorithm give better performance than Compute 5.0 or 5.2. The CUDA code is different for other Blake 256 algorithms, including the one for Decred’s Blake-256 14-rounds implementation, so do not expect performance increase in others. In fact specifically for Decred, a 64-bit compilation with CUDA 7.5 and for Compute 5.x does seem to provide best performance with the publicly available ccMiner 1.7.4 fork from tpruvot. New update in the form of a Windows binary compiled from the latest Git source code of the ccMiner 1.5.78-git SP-MOD fork by SP optimized for the latest Maxwell-based video cards (source). The latest release adds support for the new Blake256 algorithm that Vanillacoin (VNL) has just forked to from WhirlpoolX. Do note that the Blake256 algorithm used by Vanillacoin is slightly different from the one used by BlakeCoin, so you need to use the one specifically for Vanillacoin! Do note that the SP-MOD fork of ccMiner is designed for Nvidia Maxwell GPUs such as the already available GTX 750, 750 Ti as well as the newer GTX 960, GTX 970, GTX 980 and GTX 980 Ti and GTX Titan X. The Windows binary release we have made available here is with support for Compute 5.0 and Compute 5.2 GPUs or with other words only for Maxwell-based Nvidia video cards compiled with CUDA 7.5 and VS2013.